You are here: Home / Crochet Other / Giveaway / Giveaways For the Fourth Week of May! Giveaways For the Fourth Week of May! Welcome to the our weekly Giveaway Link Party! 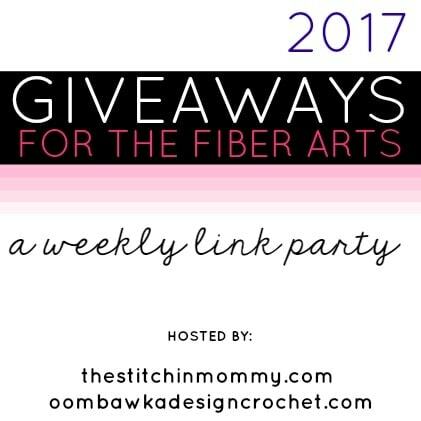 Find giveaways for your favorite kinds of fiber arts right here! Amy and browse the internet each week in search of the new giveaways taking place and we created this link up as a way to share them easily with you! If you are hosting a giveaway please add your information to the widget below – just like a regular link party! Remember to include your Giveaway it must be Fiber Arts Related – so yarn, threads or fabric related – books for fiber arts projects can be added too! Amy and I will occasionally include other interesting Giveaways you may wish to enter (for items other than Fiber Arts) which we have found online. Giveaways for crafts using paper and stamping, coloring, painting, children’s craft items and even kitchen gadgets…sometimes we may add a link to a giveaway to something else we love and think you will love too!